To alleviate poor shifting and uneven drive train wear, manufacturers recommend chain replacement before rear cog replacement. 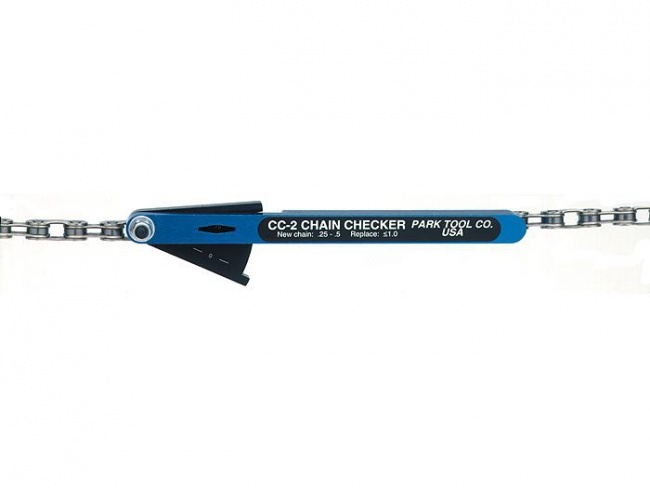 Now you can quickly and accurately determine the wear and stretch of any chain with the Park Tool Chain Checker. Simply insert the Chain Checker’s pins into two links, press the swing arm gauge tight, and then check the gauge window for an accurate reading. The CC-2 is 10 and 11 speed compatible. For the modern 9 and 10 speed chains, replace chain at or just before the 0.75% readings. For the 11 speed chain, replace at or just before the 0.5% reading.